Backing Up a Running Virtual Machine? No Problem! You need to back up your virtual machine but do not want to install anything in the operating system or shut down your important services? Surely there has to be an effective method that will save you downtime and your sanity? The good news is that there is now. Grab a coffee, kick off your shoes and find out how your system admin life is about to get much better. Of course, the major pain point when it comes to backing up is the fact you don’t shut down servers. They are designed to run forever with the constantly changing data on the hard drive. It would be like stopping your e-shop to make a backup. The result would be, you would lose customers, and more importantly, you would lose money. But what are the necessary steps to perform a backup of a running virtual machine? 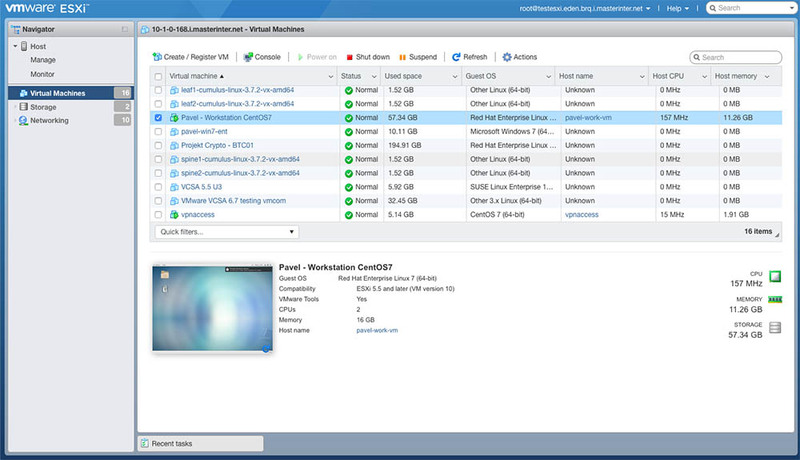 Almost every backup software works in a very similar way, meaning they create a snapshot that tells the VMware, “This is the VM’s current state”. This means that every subsequent write operation will go to a separate virtual disk (also called a “delta disk”) to keep the original in a point-of-time state. Then, it’s a very simple copying operation of the original frozen virtual disk into your backup storage. Once it’s done, you can perform a subsequent operation of deleting the snapshot, which basically means the write operation that came after the snapshot is moved back to the original disk. It’s all done on the fly, the VMware does it for you. So the only thing that the backup software does is tell the VMware, “Ok, take a snapshot”, then it copies the data and then tells the VMware to delete the snapshot. It’s a very simple task when you strip it down like this. And all the magic in the backup software, it comes afterwards. It’s connected to what you can do with the backup. Not all solutions are built equally. It’s important to know how to avoid those that have limitations and pick the best solution for the task in hand. The over-complexity of some software means system admins are faced by a behemoth that promises all the bells and whistles but delivers the opposite. Having a simple, easy-to-use solution that is intuitive, user-friendly and performs its job well and reliably is key to creating a fluid backup system environment. It avoids an unnecessary and time-consuming learning curve before you are even ready to use the software! With VMcom, even if you are a half-decent system administrator, you will be able to use it. Before embarking on using any new software, there are always considerations that new users should bear in mind, and backing up virtual machines is no different. The snapshot operation that is essential to creating a backup takes up disk space. If you imagine that you have a virtual disk that is one terabyte and you freeze it, all the subsequent writes will go to a different disk. You will write another terabyte and it will write two terabytes instead of one on your primary data store. So you need to be aware of this and make sure you have enough disk space on your primary datastore so you don’t run out of disk space, which you need to avoid. If it happens, it is a big issue! Also, during the snapshot operation and the snapshot deletion, it adds some stress to infrastructure. It needs some computing power and storage performance, so your virtual machine will actually run a bit more slowly. It is annoying but you are not able to avoid it. You are running some disk operations, so your storage runs more slowly. So, running backups during off-peak hours means you are performing them when your servers are not under such a heavy load. And last but not least, you may encounter some network issues as it will be under a lot of stress during the backup. The hardware requirements for running the software for backing up virtual machines are minimal. However, making sure you have extra performance available, especially on the storage side, is a good idea. I also recommend reasonably fast backup storage so it does not negatively affect the speed of your backup operations—this is the secondary storage to which you will copy the backup. If you use slow storage, sometimes the backup can time out or take longer than necessary, so get good additional storage to avoid this. I hope by this point you are not feeling overwhelmed by the thoughts of backing up your virtual machines. It’s true that companies don’t always have a dedicated person in house full performing backups. So you are probably wondering if you want to start, is it easy for you to get somebody quickly onboard and educated? The answer is with VMcom it's super easy. It's designed well. Basically, the person who manages VMware can grasp VMcom quickly. As I already wrote, with other vendors, it is going to take some time to learn the software. But fortunately, using our solution, the person that takes care of VMware should also take care of the backup software as they have the appropriate admin privileges. And the point about the right person having the right privileges is essential for shared environments. Meaning you need a backup solution that offers multitenancy when you have multiple teams using the VMware. The core administrator can give the virtual machine owner self-service backing-up capabilities, which is impossible with other solutions, so they can perform the backing up and recovery themselves. But they do not have additional rights to the VMware so that you avoid any critical damage to your backup environment. So, making sure that you avoid any downtime by using intuitive and easy-to-use software makes the role of system admin much easier. Also, being aware of the stress to your system that backing up can cause and factoring that into your storage system and scheduling for “quiet” server load will help avoid any unpleasant downtimes. And by having multitenancy in shared environments will mean that owners of virtual machines can take care of the backing up and recovery themselves and eliminate the risk that comes with poorly defined system admin roles, all without switching anything off!